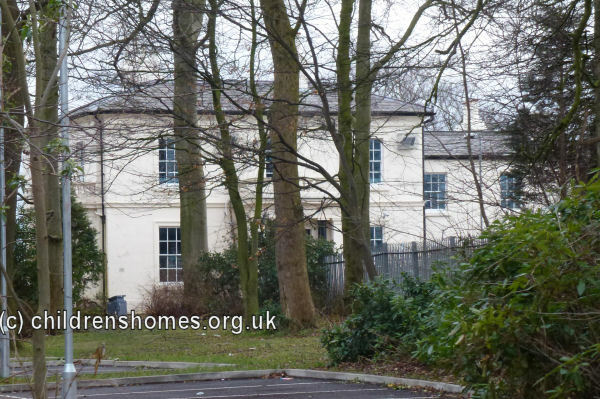 The Bishop O'Reilly Memorial School was opened in 1894 at Honey's Green Lane, Leyfield, West Derby, Liverpool. It was named in memory of the recently deceased Roman Catholic Bishop of Liverpool, Bernard O'Reilly, and was run by the Daughters of Charity of St Vincent de Paul. The main role of the School, which was also known as the Liverpool Diocesan Poor Law School, was to receive Catholic children from within the Liverpool Diocese who might otherwise be living in workhouse accommodation. To this end, the establishment was formally accredited as a Certified School on 23rd November, 1894. The premises initially accommodated up to 192 children, aged over 7 years at their date of admission. The school is situated on the highest point of a fine site, bounded on the north-west by Honey's Green-lane and on the south-east by the Prescot-road. It measures 238 feet across the south-west front, and 113 feet across the north-west side. The chapel and dining-room are built larger than is required at present, in order to provide for a future enlargement of the place. The school consists of four floors, including the basement. The basement, which is well lighted by means of grass-sloped areas, contains the larders, heating-rooms, and temporary workrooms. The ground floor contains the reception rooms, school and class-rooms, sisters' parlour and dining rooms, the kitchens, business-rooms, boot-rooms, and children's dining-room, 76 feet long and 30 feet wide. The first floor contains the chapel, 107 feet long, 30 feet wide, and 20 feet high, with a smaller side chapel for the sisters, three dormitories, each about forty feet long and 30 feet wide, clothes-rooms, lavatories, bathrooms, &c. The second floor is arranged similarly to the first floor. The building is well lighted and ventilated throughout, and is warmed by low-pressure hot water pipes. An efficient service of hot and cold water is carried to all parts of the building. The playgrounds are very extensive. Portions are being laid out for asphalte paving, and the rest will have grass for games in dry weather. The building is faced with common brickwork, relieved by red Ruabon brick string courses, arches, &c., and red Rainhill stone. Messrs. Sinnott, Sinnott, and Powell were the architects, Mr. R. J. J. Irwin the clerk of the works, and Messrs. R. Wearing and Sons, of West Derby, the contractors. The old house on the grounds, which is well built and suitable for the purpose, will probably be adapted for use as an infirmary. The foundation-stone was laid by the late Bishop O'Reilly — whose name the schools will now bear — some eighteen months ago, and they have been erected at a cost of £10,000. The land, which is twenty-five acres in extent, cost £6,000, and with £2,000 to be spent on furnishing the building, the total expenditure reaches something like £18,000. Following the opening of the boys' Diocesan School at Preston, also dedicated to Bishop O'Reilly, the Leyfield establishment became a girls-only institution, although it did admit boys up to the age of 7. By 1912, the construction of further buildings at Leyfield had increased the total number of places to 350. As suggested in the above report, the old house on the site, Leyfield House, was indeed converted for use as an infirmary. In 1956, the Daughters of Charity withdrew from the establishment and took over the running of the St Catherine's Orphanage for Girls at Druid's Cross. Also in 1856, Leyfield School as it had by then become known, provided temporary accommodation for a number of refugees who had fled from the political unrest in Hungary. In 1958 the site was renamed the Cardinal Allen School and in 1983 became the Cardinal Heenan High School. The school was almost totally rebuilt in 2011 and is now known as the Cardinal Heenan Catholic Sports College. Daughters Of Charity Of St Vincent De Paul, Provincial House, The Ridgeway, Mill Hill, London NW7 1RE. (Archivist: Sister Bernadette Ryder DC) Has Birth and Baptismal Register and notes.